Engineered flooring is known to be an eco-friendly flooring option because if uses less wood than standard hardwood. All engineered wood flooring starts with an inexpensive plywood base, commonly bonded together with harmful/non-eco-friendly adhesives. A thin piece of hardwood is then adhered to the top of the plywood. 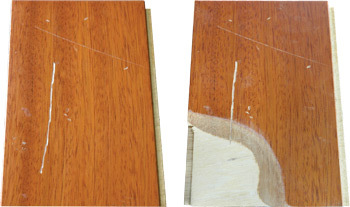 Below is a cross section showing the composition of a typical engineered flooring plank. After many years of use, an engineered floor may need to be refinished. This is the major drawback of engineered flooring. By only having a small wear layer, refinishing an engineered floor is nearly impossible! The above photo is an example of a piece of engineered flooring that was sanded down too far when it was being refinished. You can see the scratch penetrated all the way down to the plywood layer. With only a thin wear layer of hardwood, most engineered flooring is unable to be refinished. Improper or careless sanding can remove the top wear layer and the cheap plywood base (see pic to the right). Engineered flooring can be installed in almost any application. Engineered flooring resists cupping, but the life of the flooring is relatively short in comparison to other options. Many engineered flooring manufacturers claim refinishing can be done, but it varies by brand and the severity of the damage to the wear layer. That fact that your flooring may need to be replaced after a short time takes away from any eco-friendly benefits. Harmful glues and finishes are additional negative aspects. High quality engineered flooring looks similar to a solid wood floor. Avoid being misled by low-priced engineered flooring. These options have low quality plywood and a extremely thin “wear layer” that would prevent a single refinishing. The use of toxic glues and finishes is often an issue.